Borrowed any good books lately? Have we got it backwards yet again? I used to think that I did favors for people because I liked them. The liking comes first; the favor comes second. The liking causes the favor. But wait. Like so many other things, I may have got it backwards. Perhaps cause-and-effect flows the other way. Perhaps the fact that I do you a favor causes me to like you. Perhaps you can induce me to like you by asking me for a favor. 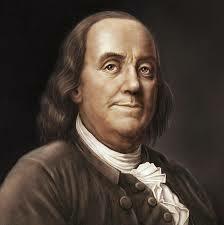 The Ben Franklin effect is not so different from the concept of the plastic brain. Through our actions, we create our brain rather than vice-versa. (See Norman Doidge’s writings here and here). What we do creates the brain rather than the brain creating what we do. This may well be the reason that buying experiences makes us happier than buying things. (The hedonic treadmill probably plays a role as well). The Franklin effect also seems similar to embodied cognition. Our bodies shape our brains (perhaps) even more than our brains shape our bodies. I use a simple form of embodied cognition to improve my mood. Each time I look at my smart phone (which is all too often), I remind myself to smile for ten seconds. Making my face smile frequently (even though it’s artificial and arbitrary) elevates my mood for much longer than ten seconds. All too often, we predict what we’re going to do and then live up to our prediction. Such predictions can produce vicious (or virtuous) circles. CBT addresses these automatic negative thoughts (ANTs), by asking us to change the meaning we assign to our thoughts and to change our behaviors. In essence, it’s asking us to challenge our thoughts, change our behaviors, and use our bodies to reshape our plastic brains. I doubt that Ben Franklin understood all these connections when he asked to borrow a book from a political opponent. But he did have an important insight: the action shapes the attitude, not the other way round. Think about your actions and attitudes. And, if you want someone to like you, just borrow a book.